Usually, those who are most successful don’t focus on what they have or don’t have – they focus on the unseen potential. As a result, I arrived late @ InnoVasion and came to the VSEA table with Robin sitting tired and bored beside an empty table. Things weren’t looking much better. At this point, we could have just given up and gone through the motions of any trade-show: sit at our tables, answer questions, get students to sign up. There’s no doubt in my mind that without Robin & Winnie we could not have accomplished what we did. After speaking with countless entrepreneurs, I’ve found a similar theme with successes: they have a good team. I have worked with countless other team members where my energy and passion was simply drained. Any ideas I come up with, no matter how crazy or plausible, would usually be turned down. you simply need to get out. In the tough times ahead (and there will be many of them, Yu-Kai warned) they won’t stick by you. Robin told me later how tired and unexcited he was to be there initially, but that my passion and energy really got him going. After that we just continued to play off of each other’s excitement. That’s the kind of team you want. Find a good team. It’ll be worth it in the long run and save you a world of headache (*or heartache, you never know). To summarize, it was the team that brought this idea together. Here’s a paraphrase of our conversation and how the idea started. I brought up a live stream, interviewing high school kids. Robin thought, what about pitching live on the spot? Then we thought about competing students together. Admittedly, we did not do this as well as we should have. And many times we found ourselves changing our “goals” slightly as we talked to different students. Know your goals. Make sure you’re working towards them with every decision you make. More than once, I got sidetracked and wanted to add some “cool features” to the site (like let the online streamed videos loop for visitors to see, make them full screen, add the link the front page of vsea.ca, etc) but I needed to constantly remind myself to work towards the goals of that day. Once you start building hype, people get excited and you risk doing things that, though they may be great features, don’t directly help you achieve what you set out to do. This wasn’t my idea. I was inspired by both Dominic Or’s talk on“Competing with Giants: It’s All about Speed” at Stanford as well as Tina Seelig’s challenge in her book, “What I Wish I Knew When I Was 20” to see all problems, big or small, as opportunities. But what an empowering idea that is! You’re not limited by your meagre resources – any problem, no matter how small or big, can be turned into an opportunity! 3) DON’T PLAY THEIR GAME BY THEIR RULES. MAKE YOUR OWN GAME!!! This point was definitely one of the keys to our success. In other words: don’t try and copy big companies with their resources. Figure out what limited resources your team has, find out what your strengths are, and merge those in a way no other team has! What did our team have that morning? The average answer would be to beg people to help us get rid of them. All the other booths had great stands, pamphlets, and amazing aesthetics. We had 500 folders printed on the wrong side. How were we creative? Our “lockable” folders actually became a hit and we even had students coming to our booths asking us if they could have one!! Who would have thought? I had experience streaming my iPhone live and we used that to our advantage. We knew students would love to be online, especially live, and it would help us build hype and remember the events! We also wanted to show the students using my laptop and we needed internet. Enter Robin’s iPhone to stream/tether so students could actually see themselves online as well! Don’t be afraid to learn while doing. This is oftentimes the most effective and fastest way to learn! To build off of Domnic Or’s talk at Stanford, startups & budding young entrepreneurs must user their speed and nimbleness to their advantage. Imagine you start to cross a “bridge of opportunity”, if it starts collapsing your team must be quick enough to pull out and try another bridge asap. This is what Mack was eluding to. Failing fast and often. However, if you invested so much time and energy into a bridge and it does collapse, you are either a) dead or b) at the bottom of a deep valley or stream, injured, discouraged, brokenhearted, with no real motivation to climb back up and try another bridge. Though admittedly, if you’re not too injured, you can climb over to the other side, but we won’t go there. We tried many ideas, and quickly stopped them if they weren’t successful. This allowed us to innovate very quickly. 1. Giving folders out for free, and “selling” them with the features above. Not too effective though some became interested. 2. Engaging a real entrepreneur to do a “quick pitch” in front of our booth. Got a crowd for sure. 5. Engaging multiple schools, with individual representatives. Schools would then cheer their own and build off of each other’s energy. Finding an official judge (thanks to Darren Frew from Vancouver Entrepreneurs Toastmasters Club) who could articulate clearly what the students did well and didn’t do well. Students could also learn what they could have done better to improve as well as get encouragement for doing things well. This was one of the funniest pitches and starts at 3:34 time left. If we ever do this again (and we will), here are some improvements we could benefit from. Most of them revolve around better planning. We should have gone up to the stage, to quickly announce to students the competition we were holding. And raise more visibility. The students we impacted definitely appreciated it, but we found many who did not even hear what we were doing! No one could hear us. So Winnie ran to buy speakers @ London Drugs – of course, she got back and the students had left, but darn that would have been great at the beginning. We also would have benefited from being able to connect a microphone to those speakers so more people could hear the pitches. We didn’t leverage our twitter followers to help and take part! That’s also because we don’t have a twitter account. brutal. WHAT ARE YOU WAITING FOR! GO DO IT! Don’t wait to be told, just go and try it out for yourself! Need more help & guidance? 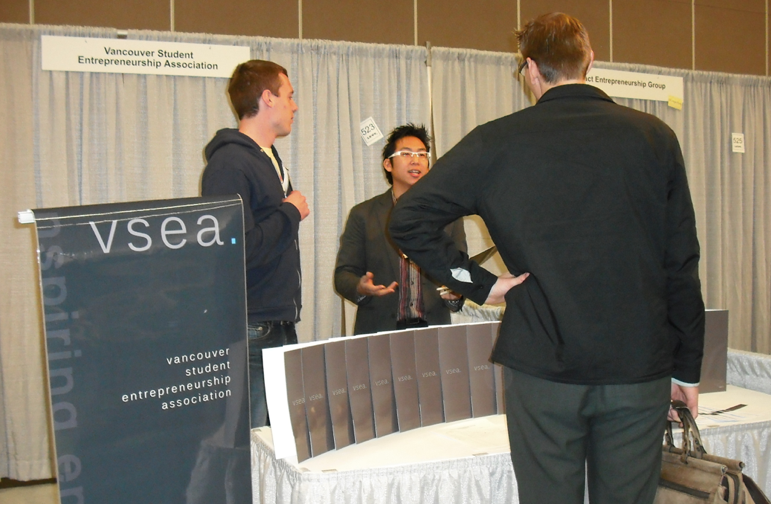 Check out http://www.vsea.ca or http://www.jonchui.com for links and guidance. Tell us how you do as well! Any other tips? Comments or suggestions? Would love to hear them in the comments below! Next Post Candid Interview with Boris Mann of Bootup Labs. #1 advice to students: “Get off your a$$ and just do it! It was an entertaining experience at Innovasion 2009. Was expecting a little more entrepreneurs but I guess they were all working. On the flip side, it was heavily attended by students. The key attraction was the key speakers besides seeing a hype being constructed from scratch by Jon. The tailored market segment for this event is towards students and youth in high schools.